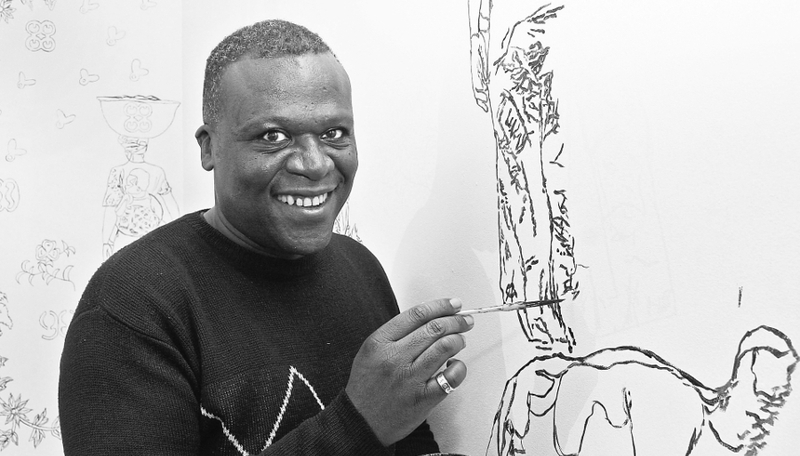 Godfried Donkor is a Ghanaian artist, living and working in London who has exhibited in Cuba, Mexico, the US, Europe and Africa. He is known primarily for his work in collage and has been described as similar to Keith Piper and Isaac Julien in his output. Some of his pieces depict boxers, such as Jack Johnson and Mohammad Ali. Donkor has been the subject of numerous solo exhibitions, both in the United States and in Europe, and was Ghana’s representative to the 2001 Venice Biennale. His work is in the collection of the National Museum of African Art at the Smithsonian Institution. Donkor describes artists as hoarders, always collecting text and images to be used in later works. His creative process often begins with someone sending him a series of images or text. Donkor often assembles text and images from 1800s literature as a starting point. Donkor plans his layout with these images before beginning the drawing process, as an outline to each collage. He is known for creating juxtapositions between the modern world and the past, comparing Africa, Europe, and the Caribbean. His most recent showcase was at the 2016 EVA International Biennial in Ireland.